Sol LeWitt first exhibited his Variations on Incomplete Open Cubes at the John Weber Gallery in New York City in 1974. It consists of 122 2⅝ʺ wooden cube frames, each with various pieces missing, as well as schematic drawings and photographs of the same. No two cubes are alike. The concept is as plain as it is absorbing: Here is every possible variation of an incomplete open cube. The work is endlessly fascinating, inviting contemplation of seriality, rhythm, incompleteness, and the capability of abstract geometric forms to be concurrently simple and complex: It is at once reductive and expansive. Like much of LeWitt’s work, the thorough objectivity of Incomplete Open Cubes is also a confident counterpoint to the Abstract Expressionism that dominated the preceding era of 20th century American art. As entrancing and rigidly systematic as it is, though, it is driven by a number of decisions which might be considered arbitrarily limiting. In particular, three aspects of LeWitt’s definition of an incomplete open cube are worthy of debate, as they significantly restrict the concept’s possibilities. According to LeWitt, a minimum of three parts is necessary to imply the dimensionality of the cube. Height, width, and depth are each represented in all of his variations. But must all three dimensions be explicitly established to be understood? Given that the full work is a collection of many different configurations, a one- or two-part structure’s relationship to the complete cube would be made clear when seen alongside its more complex cousins. For that matter, however we choose to define implied dimensionality, should it be a requirement at all? If a complete cube consists of 12 parts, wouldn’t one of those parts in isolation constitute an incomplete cube, regardless of of how discernible the part’s relationship to the larger structure is? Perhaps the most interesting and impressive aspect of LeWitt’s cubes is the one that distills them the most ruthlessly: No cube can be rotated to match another. Each configuration is entirely unique. But is the appearance of rotation the same as actual rotation? If we regard each of the cube’s 12 parts as distinct, we see that a configuration which might appear to be a rotation of another is actually made up of different parts. 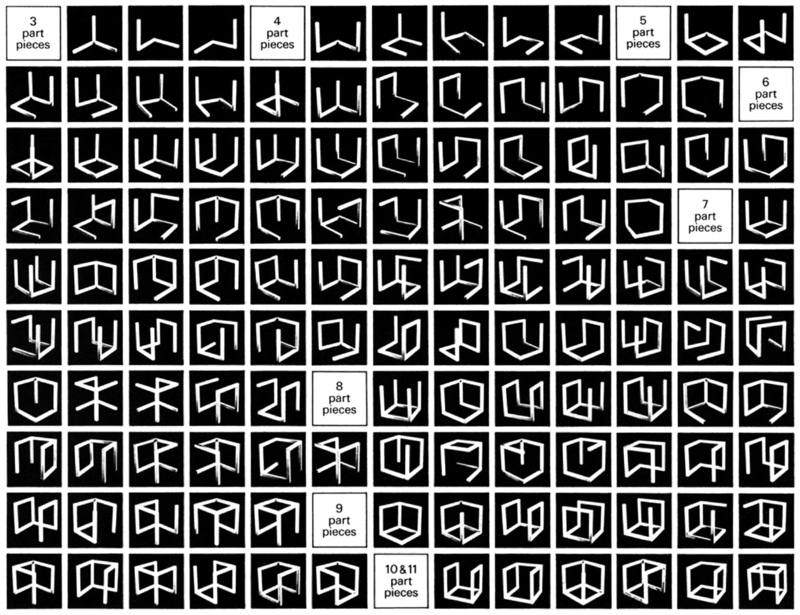 And when the part structure is viewed from a consistent perspective, these seemingly rotated configurations can be said to constitute unique forms. Variations which can be rotated to match each other may still be considered unique. When the constraints listed above are removed, a vast landscape of additional cubes is introduced. Incomplete Open Cubes Revisited has found and rendered a total of 4,094 variations (including LeWitt’s original 122), all of which can be viewed on its website. Create compelling grid patterns by harnessing specificity. My live music diary is now a website. Hi, I’m Rob Weychert, a designer and artist living in Brooklyn, NY. Read a bit more about me, have a look through my blog, email me, subscribe to my RSS feed or newsletter, or follow me on Twitter or Letterboxd. Or, you know, get back to whatever you’re actually supposed to be doing right now.